Will Fed Change its Policy on Reinvestment? With about a year left on the job, will the Fed's Janet Yellen keep with the tradition of handing over a clean slate by shrinking its mighty balance sheet? In the early morning trade, April gold is trading lower at $1,212.4 and yesterday it couldn’t hold the key level of $1223.0 an ounce. However, after this morning’s non-farm payroll number, April gold has so far gotten a slight push up. We added 227,000 jobs last month which was over 50,000 more than predicted, but last months was revised down by 40,000. Therefore, this jobs number basically says we’re still adding jobs, so this can be seen bearish for gold unless we see real signs of inflation and it also backs the Feds decision to gradually raise interest rates throughout 2017. If we take a look at a daily April gold chart, you’ll clearly see the key resistance levels gold needs to break above in order to rally to higher prices. If the investors and traders look at today’s jobs number as bullish for gold and it can push above $1,225.0, then it is not out of the question for gold on momentum to rally up to its 200-day MA, which currently rest at $1274.0 an ounce. Below is a daily April gold chart from our RJO Pro platform. On Friday February 3rd we received the Non-farm payroll report where the Dec. previous number was 156,000 and Jan expected is 170,000. The headline number for January was 227,000 which caused a small upside rally in silver. I would expect the market is really looking at this as a sign of inflation and faster growth. Of the more interesting developments that I have been watching in the silver this week has been the concept of “open interest”. Open interest is defined as the total number of futures or options contracts of a given commodity that have not yet been offset by an opposite futures or options transaction nor fulfilled by delivery of the commodity or option exercise. Each open transaction has a buyer and a seller, but for calculation of open interest, only one side of the contract is counted. It’s very important to be able to identify these types of events and be able to come up with a strategy ahead of time. Open interest in the silver market went under intense liquidation following the gold market much of last week and built it back much of this week. Look for a punch through $17.75 in order to trigger the next potential bull move to $19. How much longer will crude remain in this range!? March WTI crude oil futures gave us quite the head fake after last week’s futures cast! At that time, the crude market looked like it was ready to break out of its 54.00 to 52.00 range after breaking above trend line resistance. As expected from my previous crude futures cast post, price did come back to retest that broken trend line resistance, now as support, into the 53.00 handle, but extended its decline a bit further to re-test the confluence of supportive technical indicators just above the 52.00 area. The decline extended a bit further than I anticipated, but failed to break below the key prior lows at 51.72 from January 18th. With the recent move back to test the 54.00 resistance area, crude remains in a tight range and is building potential energy for a move one way or another. From a technical perspective, recent price action is looking more constructive to the upside, as it has begun to make a series of higher highs, and higher lows with each turn to the upside. I am still expecting WTI crude futures are forming a base above 52.00, with upside projections from this range still into the 58.74 area. With every minute this market remains in this tight range, more and more stops will build in the market, likely resting above prior highs and below prior lows. These stops will be the fuel for a move in either direction, and as soon as they begin to trigger, the flood of market orders that follow from such events is an instant spark to volatility! This week’s EIA Petroleum Status Report (from 2/1/2017) saw a significant build in crude oil inventories of 6.5 M barrels, compared to a 2.8 M barrel build in the prior report. This was largely ignored by the market, as price has remained relatively well bid, suggesting its possible demand expectations have risen or the increased supply on hand has already been priced into the market. It will be important for traders to continue to monitor news headlines for multiple geo-political events, i.e. the new Trump administrations renegotiation of trade deals with Mexico (tied for 9th/10th largest oil producer with Iraq! ), Iranian missile test, and any other turbulence with oil producing nations. The trend in Natural Gas is sideways to down. There is resistance at the 3.280-3.350 level, and then at the 3.390 level. Close in support starts at 3.200, and continues down to 3.110. A break though the 3.110 mark may signal a run to November’s low of 2.770. Momentum studies are trending lower with RSI, Slow Stochastics, and MACD all at mid-levels, and heading toward the oversold status. Natural gas is below the 9, 18, and 27 day moving averages, and is a good bet to continue south until some bullish news is injected into the market. Failed support at 3.240 could mean another strong leg down. The National Weather Service predicts above average temps for the next 10–14 days. A slide of over 3% this week sets the stage for one of the worst months of trading in a few years. A draw of 119 bcf for last week’s storage started the current down-trend. A recovery bounce trying to fill Monday’s gap should fail, signaling deeper sell offs. A close above the top resistance numbers of 3.390 is needed to negate the current trend and give the bulls control once again. A cautious bear play is recommended, or moving to the sidelines to wait for the next long entry point. The past week's eroding price action after a retest of 19-Jan's 21.38 high is consistent with our peak/reversal count introduced in 19-Jan's Trading Strategies Blog that recommended a short position on a recovery attempt to 20.75 OB. As a result of this latest spate of erosion scalpers with very tight risk profiles can objectively trail protective buy-stops to 21.00, or just above 24-Jan's 20.99 reactive/corrective high. perhaps most importantly, a historically frothy 97% bullish sentiment level in our RJO Bullish Sentiment Index. Can Cotton Continue to Rally? News of record spec net-long positions and open interest levels not seen since 2008 continue to dominate the headlines as March cotton futures posted their highest close in over a year. On Tuesday, February 1st, traders saw an upside breakout from the most recent near-term consolidation range, once again reiterating the positive tone in cotton. Technically, the market appears incredibly strong with Wednesday’s relative highs coming on strong volume. The RSI indicator has continued to oscillate between the 80-40 range, which can be used as OB/OS signals in a bull trending market, again reiterating the positive nature of cotton. Our exports here in the US continue to be strong with the most recent sales coming in at 328,700 running bales. So long as cotton demand continues to be healthy, strength in cotton futures prices appear poised for further strength as we head into the month of February. The positive structure of this market remains valid above the recent swing low (71.71) and both the short and intermediate term trends remain positive. The August 5th blow-off top registered a 78.00 high trade and cotton prices appear poised to retest this prior swing high from several months back. Back on January 10th of 2017, we witnessed March coffee break above the 14535 resistance area. Subsequent strength followed, reaching highs not seen since November. Since reaching close to the 15700 level, it appears March coffee is now going into a healthy-sized correction, with long liquidation. Throughout this last selloff, we’ve seen March coffee break below the corrective low of 14675, from January 18th of this year. This violation could possibly suggest more corrective price action to follow. Heavy rains are forecasted in key Arabica growing areas of Brazil, adding continued pressure to the March coffee futures contract, keeping bullish traders in profit-taking mode. This wet weather should help to offset and balance the current low supply of Robusta coffee in Brazil, and ultimately make for a stronger long term supply outlook. 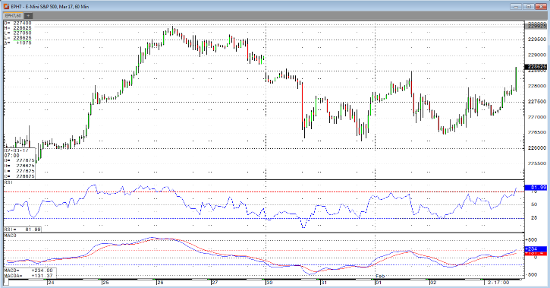 Heading into the Friday trade - March cocoa closed lower after two positive sessions. The dollar tried to move higher and the Euro failed and traded lower for the second straight day. Is the “Trump rally" coming to an end? Will the pullback in the Dow continue to carry over to commodities? These questions have added to already volatile markets. Pressure in the currencies has weighed onto the commodities. The demand of cocoa continues to struggle. Export numbers are weak out of Ivory Coast. Technically, a continued close below the 9-day moving average is also negative. But, levels appear to be oversold and further out call options are still on the pricier end, so these indicators could be previewing a recovery. 2070 has held in the March contract so continue to monitor this area on a chart. RJO Futures Senior Market Strategist Stephen Davis discusses the grain futures markets. Corn is increasingly important, both for people and animals. Exports in grains will always be present, how are they fluctuating this week? We expect a USD rally, but will the rally hold? March Dollar: The USD this morning continues to benefit from the reversal action off the low in the prior session but it is also benefiting from somewhat soft Chinese and European readings. It is also likely that the currency trade generally expects US non-farm payrolls to be strong enough to leave the growth mantra in place. However, the dollar has seemingly entrenched itself in a downward trend since the January highs and it could take a top of the range gain in payrolls to effectively throw off that negative bias. While we think the number will be above 154,000 and that will cause an initial rally we are highly doubtful the dollar will sustain that pulse up move into next week. Downside resistance at 10061. March Euro: With European services and composite readings countervailing each other overnight the decline in Euro-zone retail sales leaves the net fundamental tilt in the bear camp to start today. It goes without saying that noted recovery action in the dollar from the lows yesterday leaves the euro under a negative technical analysis bias. As suggested in the dollar coverage we suspect that US payrolls will be “good enough” to leave the euro in a downward track. Downside target is seen at 10715. To negate this downward momentum we will need to see prices above 10800 today. March Yen: The Yen appears to be coiling at the end of this week for a critical decision. While the market gas maintained a well-defined upward trend since the mid-December low, we are suspect that this pattern will continue through today. Support comes in at 8744 today, there would seem to be room for a washout without altering bigger picture trends. Resistance comes in at 8930-8940, and then 9042. Kicking off the start of February, equity markets were boosted by news from Apple when they managed to beat earnings and sales projections. Furthermore, it seems as if the market is garnering some lift today from Snapchat IPO optimism and favorable chart set up. I believe that this morning’s better than expected Non-farm Payroll number is exactly what the bull camp needed to return toward January highs, and a favorable technical setup leaves the E-Mini S&P with a positive track to start the month. While the mini Dow today might offer the least amount of volatility, it appears to start the trading session in the tightest range and the closest to potentially crucial support. The index remains above its 50-day moving average at 19662 with uptrend channel support seen at 19746. This past week the NASDAQ mini has revealed the most upside momentum and a series of lows around the 5119.50 level, it could be an all or nothing condition going forward this morning. Uptrend channel support is seen at 5109.75 today. Overall, January Non-farm Payrolls number came out better than expected at 227k, and we can expect stocks to continue trading with higher highs and higher lows for the coming weeks ahead.